For all of your Stone Walkway Needs! This stone path / walkway has a mixture of rectangular pieces of stone which compliment the home perfectly. For all of your Nashville Walkway Needs! The colors of this stonework path / walkway are brown, tan, gray, and a little light red. 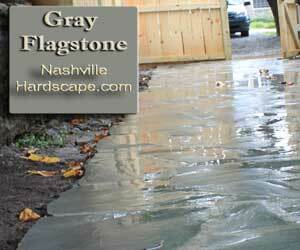 This nashville walkway is made of gray flagstone and has a gray mortar. This is a very classy look in a walkway. 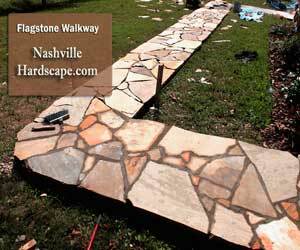 This nashville walkway is made of tan flagstone and has a gray mortar. 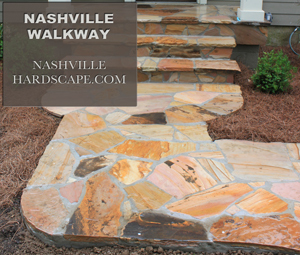 This is a very relaxed look in a walkway or porch.Get your Nashville Walkway Now ! 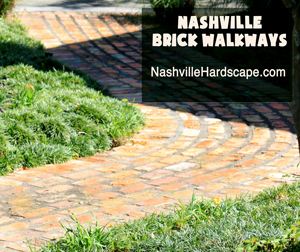 This nashville backyard path / walkway is made of pavers, there are different styles to choose from. This walkway goes well with natural stone walls or other paver, brick, concrete, or stone hards surfaces. Call us today to get your Brick Walkway installed. 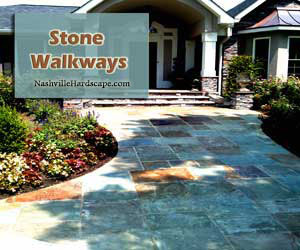 We are Walkway Installers in the Nashville Tn area. 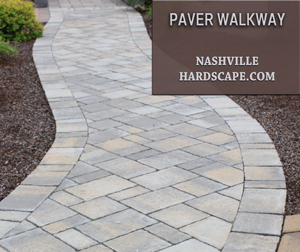 We provide Walkway Installation services to the Nashville Metro area and surrounding counties. We service Green Hills Tennessee, Tennessee, Murfreesboro, Smyrna, Brentwood, Franklin, Hermitage, Leipers Fork, Thompsons Station, Belle Meade, Green Hills, Kingston Springs, Brent Meade, Oak Hills, Almaville, Fairview, Forest Hills, Nolansville, Mount Juliet, and these counties: Williamson County, Davidson County, Maurey County, Rutherford County, Wilson County, Dickson County, Hickman County, and Marshall County Tennessee. West Nashville, East Nashville, North Nashville, South Nashville, North, South, East, West, Nashville area, Walkway, nashville Walkway installation, backyard walkway, front yard walkway.